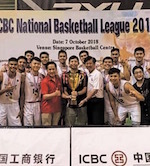 Singapore Xin Hua Sports Club completed their meteoric rise to the top of the local club basketball scene when they won the National Basketball League Division I championship last night. In a high-tempo final watched by about 1,000 fans at the Singapore Basketball Centre, Xin Hua, whose basketball team were set up just last year, beat Safsa 76-61. Their result was all the more impressive considering they were behind by nine points in the third quarter and led for the first time as late as 1:15 into the final period. Xin Hua captain Folkoff Mitchell (180-PG-89) the final MVP with 13 points and 12 rebounds, said: "We were disciplined and they ran out of gas as we applied full-court pressure towards the end." Xin Hua coach Han Lijun added: "We have good depth and all 12 players had at least six minutes on court. "As long as we didn't fall behind by too many points, we were confident of pulling through with good defence and rebounding."